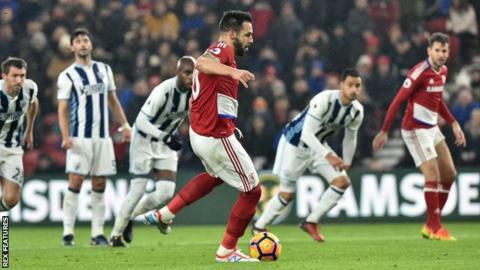 Middlesbrough came back from a goal down but were left frustrated as a resilient West Brom claimed a point at the Riverside Stadium. The in-form Baggies started the game stronger and took the lead from their first attack as James Morrison fired home from long range after the home side had failed to clear a free-kick. But Boro levelled soon after through Alvaro Negredo's penalty after the Spain striker had been fouled in the box by Gareth McAuley. From that point on, Aitor Karanka's side looked the more likely to win the game, although West Brom hit the woodwork three times through Craig Dawson's header and, in the same attack, a Matt Phillips header and Salomon Rondon shot. The two dropped points were made even worse for Middlesbrough by wins for relegation rivals Swansea and Crystal Palace. The results leave Boro, who are now without a win in six Premier League games, just two points above the bottom three. West Brom, who had the chances to claim three points themselves, stay eighth, but have missed out on the chance to put pressure on Everton above them. The result will only add to the seemingly ever-increasing frustration of Middlesbrough boss Karanka. The Spaniard, who missed a game last season amid reports he was considering his position before returning to lead the club to promotion, has been critical of both their fans and board in recent weeks. Clearly unhappy at the lack of transfer activity this window, Karanka's point was somewhat made for him by a display that highlighted just where the weaknesses lie. They are strong at the back, industrious in the centre of midfield and have a source of chances out wide in Adama Traore - but they remain the division's lowest-scoring side with 18. Negredo now has six of those after his penalty, but they do not have another natural goalscorer in their side. For all their possession - 62% of it in the match - the biggest tests Albion keeper Ben Foster faced was to tip away goal-bound attempted clearances from two of his own players, Allan Nyom and Darren Fletcher. For the second game running, Karanka sent on new attacking signings Rudy Gestede and Patrick Bamford, but neither were able to affect the game. With 19 senior players at his disposal, Tony Pulis has a legitimate claim to the most threadbare squad in the top flight. It is no surprise that speculation linked the Baggies with a striker during the closing stages of the transfer window as they lack a proven, game-changing attacking option if Matt Phillips and Salomon Rondon have an off day, which was the case on Tuesday. Things were looking good after Fletcher teed up Morrison to fire them ahead, but after Boro's equaliser the game could have gone either way - but the fact the visitors did not win was largely down to poor finishing. Dawson capitalised further on Boro's vulnerability at set-pieces to place a header too close to Valdes, who palmed the effort on to the post. In one extraordinary moment, an unmarked Phillips stooped low to head a cross against the base of the post before Rondon fired the follow-up against the other upright and wide. "It is a definite penalty. Negredo uses his body well, he's clever by stepping across the ball. McAuley goes genuinely for ball but his foot is too high and he takes the man out." The Baggies are unbeaten in their past five trips to Middlesbrough, drawing three, after a run of 18 games without a win there in all competitions. Alvaro Negredo is the first Middlesbrough player to have been involved in 10 goals in a Premier League season since Tuncay Sanli (11) in 2008-09. West Brom conceded in their 11th consecutive away league game, their longest run since March 2014 (also 11). James Morrison netted his fourth Premier League goal of the season, his best return since 2012-13, when he scored five. Adam Clayton created four chances in this game - no Middlesbrough player has created more in a Premier League game this season. Middlesbrough boss Aitor Karanka: "It was a good point. We had chances to score and have conceded a goal in a way we knew. It is frustrating. "West Brom are a strong team and we played with everything. I am proud of the players. As a coach, they have done everything. "We had the game under control against a strong team. A point is fair for everybody. The opponent have a lot of experience and good players. Sometimes you can't stop them." West Brom manager Tony Pulis: "The penalty changed the course of the first half. We were comfortable and had chances to get a second. "I don't think it is a penalty. Negredo is a big lad and puts himself about. He drops his body in the way of Gareth McAuley. The ref has to be 110% certain to give it. It knocked us. Boro came into it. "Second half we create enough chances to win the game. It wasn't going to be our night." West Brom host Stoke at 15:00 GMT on Saturday, while Middlesbrough travel to second-placed Tottenham the same day for a 17:30 kick-off. Match ends, Middlesbrough 1, West Bromwich Albion 1. Second Half ends, Middlesbrough 1, West Bromwich Albion 1. Attempt saved. Hal Robson-Kanu (West Bromwich Albion) right footed shot from the centre of the box is saved in the top right corner. Assisted by Matt Phillips with a cross. Rudy Gestede (Middlesbrough) wins a free kick in the defensive half. Substitution, Middlesbrough. Rudy Gestede replaces Álvaro Negredo. Offside, West Bromwich Albion. Chris Brunt tries a through ball, but Matt Phillips is caught offside. Attempt missed. Matt Phillips (West Bromwich Albion) right footed shot from the right side of the box misses to the left. Assisted by Hal Robson-Kanu following a set piece situation. Attempt saved. Chris Brunt (West Bromwich Albion) left footed shot from outside the box is saved in the bottom left corner. Assisted by James McClean. Corner, West Bromwich Albion. Conceded by Víctor Valdés. Attempt saved. Chris Brunt (West Bromwich Albion) left footed shot from outside the box is saved in the top centre of the goal. Assisted by Claudio Yacob. Attempt blocked. Hal Robson-Kanu (West Bromwich Albion) right footed shot from the right side of the six yard box is blocked. Attempt missed. Matt Phillips (West Bromwich Albion) left footed shot from the centre of the box is too high. Assisted by James McClean with a cross. Attempt blocked. James McClean (West Bromwich Albion) right footed shot from outside the box is blocked. Assisted by James Morrison. Substitution, Middlesbrough. Patrick Bamford replaces Cristhian Stuani. Antonio Barragán (Middlesbrough) wins a free kick in the defensive half. Substitution, West Bromwich Albion. Hal Robson-Kanu replaces Salomón Rondón. Cristhian Stuani (Middlesbrough) wins a free kick in the attacking half. Attempt blocked. Adama Traoré (Middlesbrough) right footed shot from outside the box is blocked. Attempt blocked. Álvaro Negredo (Middlesbrough) left footed shot from the centre of the box is blocked. Substitution, West Bromwich Albion. James McClean replaces Nacer Chadli. Attempt saved. Ben Gibson (Middlesbrough) right footed shot from the centre of the box is saved in the bottom left corner. Assisted by Adam Clayton with a cross. Corner, Middlesbrough. Conceded by Ben Foster. Salomón Rondón (West Bromwich Albion) hits the left post with a left footed shot from the centre of the box.